Cladding Refurbishment of Mini Dealership in Worcester. anda Coatings refurbished cladding and the metal framework on the Mini dealership in Worcester recently. The client was extremely cautious about letting more paint sprayers loose on his showroom because the previous contractor he had employed managed to cover some cars with overspray. He was understandably not happy with the resulting repair bill for £12,000 and wanted to make sure that this did not happen again. It was of the utmost importance that the minis did not have even a spot of stray paint on them while cladding refurbishment took place, so practically everything was covered in plastic sheeting. There was scaffolding up outside the whole building and our Vanda team leader decided to put sheeting up outside the scaffolding as can be seen in the bottom photo. The operatives then worked inside this scaffolding and sheeting, so no paint spray could escape. This protective measure was in addition to masking off all the windows and doors as well as signage and the air conditioning units around the back of the building. The exterior was weathered, but not too dirty. Even so, the whole building was jet washed. The team leader then examined all the metalwork to identify scratches and dents. These were all repaired and filled before the coats of primer were sprayed on. 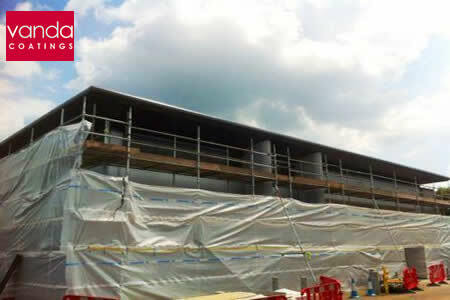 Cut edge protection was also spray applied to the edges of the cladding. Corrugated cladding is cut to fit buildings and if the edges are exposed to the elements, cut edge corrosion can set in which can cause problems with the structure of the buildings. Part of our service is to repair cut edge corrosion, but we also take preventative measures to save businesses expensive repair bills in the future. Once the necessary repairs had been carried out and the primer applied, our team spray painted the Mini dealership with top coats in a sleek black. With the extensive precautions taken to prevent overspray, all the cladding refurbishment of the Mini dealership in Worcester was completed perfectly as shown in the top photo. The client was extremely happy with the finish as well as how the project had been handled. 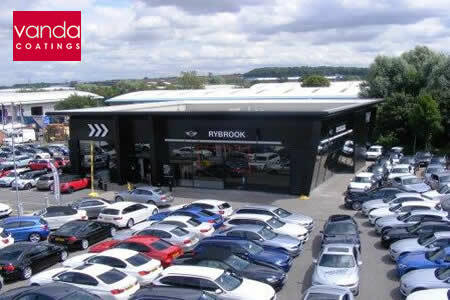 As a result Vanda Coatings were asked to re-spray the BMW dealership on the same site which we were happy to do.